The holiday included accommodation for three nights in the National Trust bunkhouse, all meals, transport between the bunkhouse and the work-site, and training/supervision by two experienced dry stone wallers. All of this for just £90! Costs are kept low by the accommodation being in dormitories, and because everyone attending has to take a turn at cooking one of the evening meals. This was made easy for us: our holiday leader, Sue, had prepared the menus, bought all the food, including bringing fresh food from her own garden, and had cooking instructions printed out for all of the meals. Our first morning of work was bitterly cold, with a wind that had originated in Siberia cutting through the layers of clothing. Our instructor, Andy Houghton, started with an introduction to the tools we would be working with: crowbars, spades, shovels, mattocks, hammers , and home made batter frames and lines to make sure the wall was straight, and the right shape ). We were working on a section of wall near Ysbyty Ifan that was deteriorating quite badly. It is better to take down and a rebuild a wall before it falls down: it’s easier to remove and sort the stone if the wall is still standing. Our first instruction was on how to take down the wall, and sort the stone into rows and piles in such a way as to make rebuilding easier. Mercifully, we were then able to start work and start to warm up. 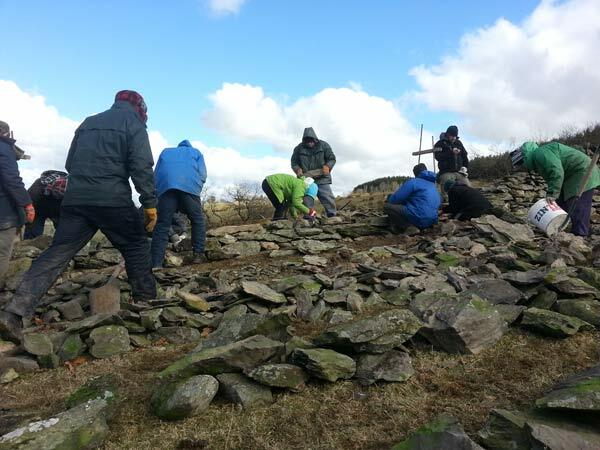 We took down and sorted the stone, so that the coping stones for the top of the wall were put in a row furthest away from the wall, as they would be needed last for the rebuild. Then the building stones – the ones that provide the load-bearing structure of the wall – and finally the “hearting” – small stones that are not load bearing, but which are essential to fill the gaps within the wall, and stablise the whole structure. 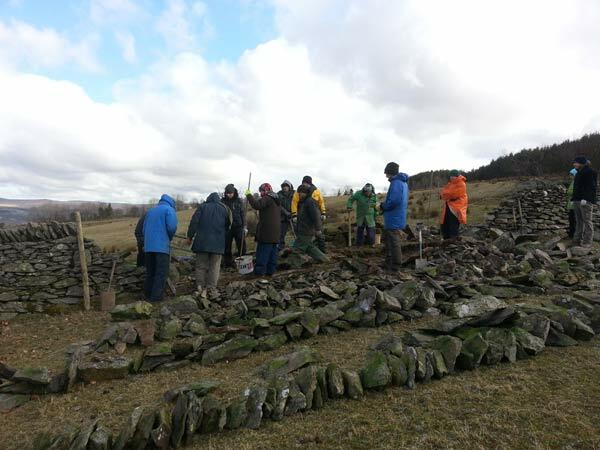 There were twelve of us on our “holiday” and we started by taking down a 6 metre long section of wall to bare ground. 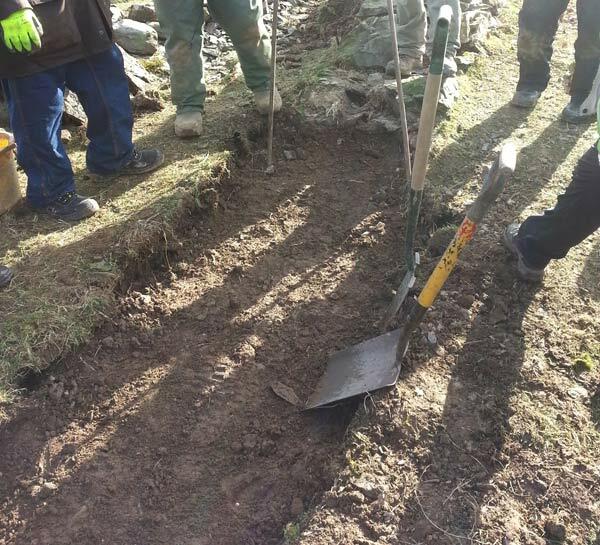 First priority was to put in new foundations: the largest stones (boulders even) that needed to be firmly placed, by digging where necessary. The building of the wall itself then got underway. 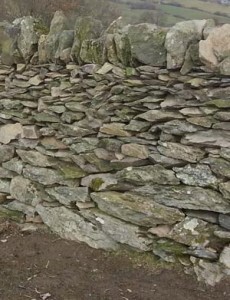 The challenge was to spot stones of the right shape and size to lock into the wall, using the biggest stones first, and gradually using smaller stones as the wall got higher. We were taught how to bridge the joins of the course below, to keep the layer of stones level whatever the slope fo the ground, and the importance of “hearting”. It’s like a jigsaw where you don’t know what the picture is supposed to be, and you don’t know if you have all the pieces. Somehow, it all started to make sense, and our speed gradually improved. 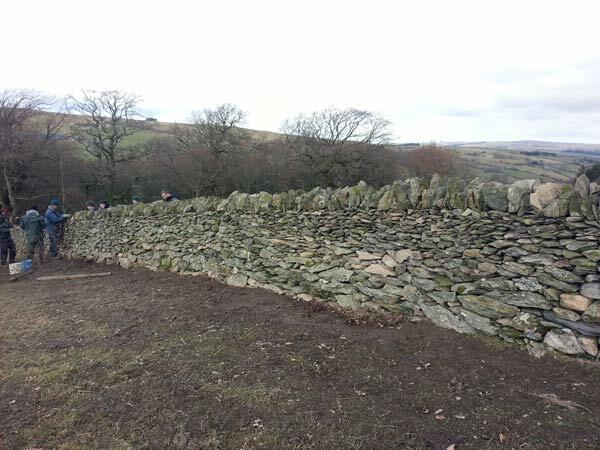 We were very content to have taken down the 6 metre section of wall, and completely rebuilt it by the end of the day, leaving just the coping, the row of vertical stones along the top, to be completed on day two. On the second day, despite a covering of snow, we completed the coping of the wall, took down a second section of wall, sorted the stones, rebuilt the wall, and completed the coping. We were definitely getting better and quicker, and working well in three teams. And it was still only three o-clock, and we were so enthused with what we were doing that given the choice of an early finish for the day we insisted on taking down another, slightly smaller, section of wall in preparation for our third day. The third day saw us complete the rebuild even quicker than we had on the second day, and we were content to walk away from a wall that looked superb, that our instructor assured us would still be standing in a 100 years. Apparently, the National Trust is not planning to run this holiday again in this location (maybe they can be persuaded) but they will still be running dry stone walling holidays in other parts of the country. 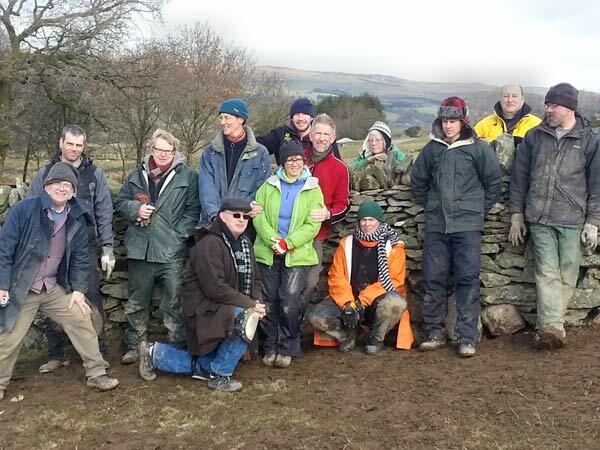 There were many things that we didn’t have the opportunity to do in just three days, but I would feel confident to tackle a rebuild of a dilapidated section of dry stone wall, sure that I would be putting in the correct structure, the right batter (the taper from bottom to top), to be a wall that would last. I thoroughly enjoyed the work, and could walk away satisfied that something had been achieved. 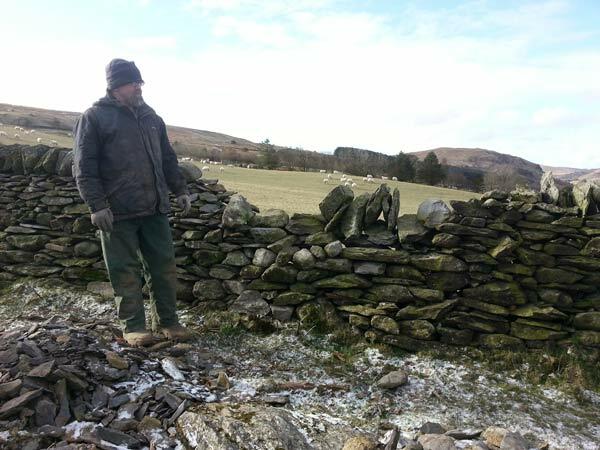 Now I need to think: has my need to learn been met, or shall I look for further training through the Dry Stone Walling Association. Time will tell. National Trust also do working holidays for path-making and classic hedge-laying projects – a good way to help, engage and learn . Working holiday leaders go for free- but it’s hard work !